Russian artist, landscape master Sylvester Shchedrin lived in Italy for many years, where he died at an early age. This explains the considerable number of paintings that are dedicated to this country. However, looking at the mastery of landscape painter and those paintings that were created in Russia, we can safely assume that if Shchedrin stayed in his homeland, he would have painted it with the same professionalism as the cities of Europe. 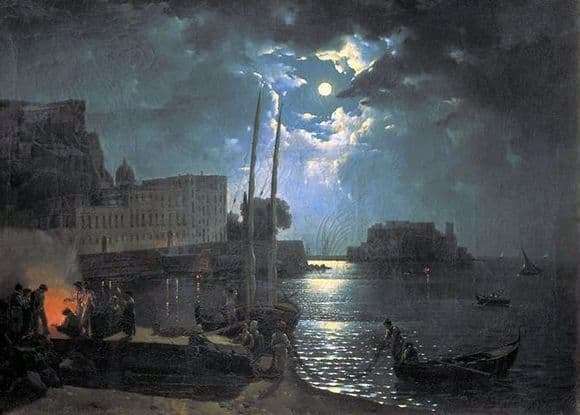 So, one of the paintings entitled “Moonlight Night in Naples.” The painting is late, one of the last. It is known that the artist, closer to his departure from life, wrote more sad landscapes, not as uplifted and colorful as early works. As if feeling the death near, Sylvester loves the tones of darker, loves to portray exactly the night views. The picture is divided into three parts, not by the artist himself, but by the viewer in the imagination. The first part is the sea. It is dark and even dark, the silhouettes of the little boats look disturbing. The second part is a lighter beach. It has a quiet house, although the complete lack of lighting inside it also causes some excitement. Only the fire symbolizing warmth, peace, drowsiness, comfort… calms. And people, basking in the fire, create a symbol of some ritual. The middle, which is at the same time the third part of the landscape, calms most of all, because here we see the brightest place – peaceful bright moonlight shines through the darkness of the clouds. In this picture, the artist also experiments: combines cold moonlight with hot fiery light. Ivan Aivazovsky honored Shchedrin, considering him one of the virtuosos of transmitting secrets and secrets of nature, a conductor between her and man. And, by the way, inherited and improved this virtuosity.